Shoulder pain is a very common condition, as Chiropractors don’t just treat back pain we see many cases each week. In many cases the shoulder pain is in part due to irritation of the neck facet joints giving referred pain down across the shoulder. It is also very commonly the result of a sporting injury or due to general long-term postural changes and wear and tear. Listed below are the common causes of shoulder pain with further information. The root cause of most shoulder pain is poor muscle function. This results in the ball of the shoulder riding up and trapping structures. The more this happens the more you get irritation and it becomes a vicious circle. Frozen shoulder or Adhesive Capsulitis is a self-limiting condition that causes the capsule of the joint to become inflamed. This causes a lot of pain, initially felt around the top and outside of the arm. As the frozen shoulder progresses the capsule becomes sticky and this locks the arm in a very limited range of movement. The process is divided into 3 stages. Stage 1 is pain and increasing stiffness, Stage 2 is pain with limited movement, Stage 3 is increasing movement with occasional episodes of pain as the tissues release. It is common to have some residual stiffness following this condition if no treatment is sought. In the initial stages frozen shoulder can cause pain on reaching and is usually very tender at night. It can be relieved with intervention aimed at restoring the balance between the various muscles that control shoulder movement. It is worth trying a course of treatment initially. However if the problem is not improving in the early stage then it should be delayed until the inflammation is under control. A cortisone injection can help reduce the inflammation associated with frozen shoulder and give a window of opportunity to start physical therapy. Alternatively the use of ice packs and an anti-inflammatory diet can also alleviate the pain to some degree. At Back In Form Chiropractic clinic we are skilled in the detection of this problem and it’s management using treatment protocols such as the Neil Asher technique. By manipulating the spinal joints, releasing the trigger points with dry needling, trigger point therapy and kinesio-taping we can re-educate the movement patterns which will hopefully speed up your recovery and improve your outcome. Impingement syndrome describes the trapping of structures in the shoulder. The pain is usually quite sharp with a dull ache down the top and outside of the arm for a while afterwards. 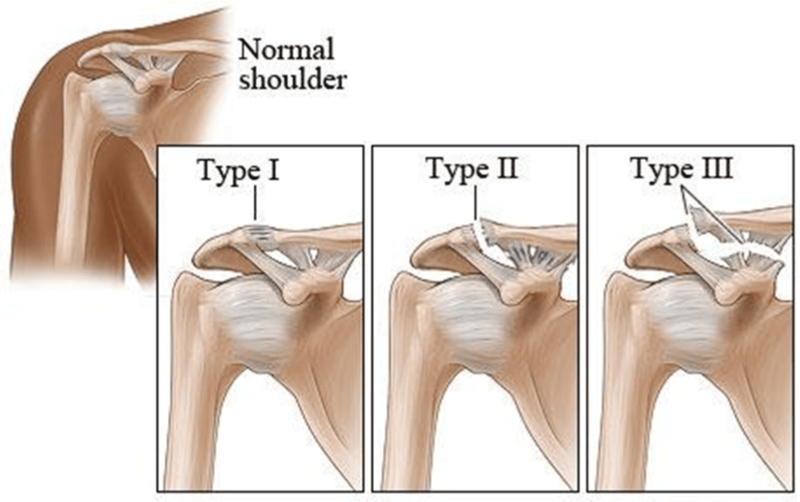 Usually the structures trapped are the bursa and rotator cuff tendons. This is again caused by poor movement patterns. These can start after an injury, such as fall on outstretched arm or due to repetitive movements when there is reduced space for the bursa or tendons. Wear and tear of the acromio-clavicular joint (the knobbly one at the top of the shoulder) can often be a factor and may limit the outcome. In severe cases that do not respond to the Chiropractic and Physio techniques used here surgery can decompress the area, giving space for the structures to heal. The Rotator Cuff muscles support the shoulder within the shallow depression of the socket or Glenoid fossa. These muscles can commonly have tears within them due to injury, repetitive sports strains or due to long standing irritation due to an ongoing impingement. Treatment is (you guessed it) aimed at restoring movement patterns and reducing inflammation using Chiropractic adjustments, active release, taping, dry needling and active and passive rehabilitation exercises. If these are partial we can help to reduce pain and improve function with rehabilitation exercises. In most cases full function can be restored so that you can continue to live without the need for surgery. Even if there is a full tear function can continue, provided muscle strength is maintained.